An employment summary based on the U.S. Bureau of Labor Statistics’ (BLS) November 2015 monthly jobs report. The U.S. economy added a stronger-than-expected 271,000 jobs, beating Wall Street’s expectation of 180,000. BLS’s November 6 employment summary saw a big increase over last month’s weaker-than-expected 142,000 new jobs. Companies laid off seasonal workers at the end of summer, which led to dismal employment figures for August and September. However, many economists anticipated an increase in hiring close to the holiday season as retailers look to hire temp workers. 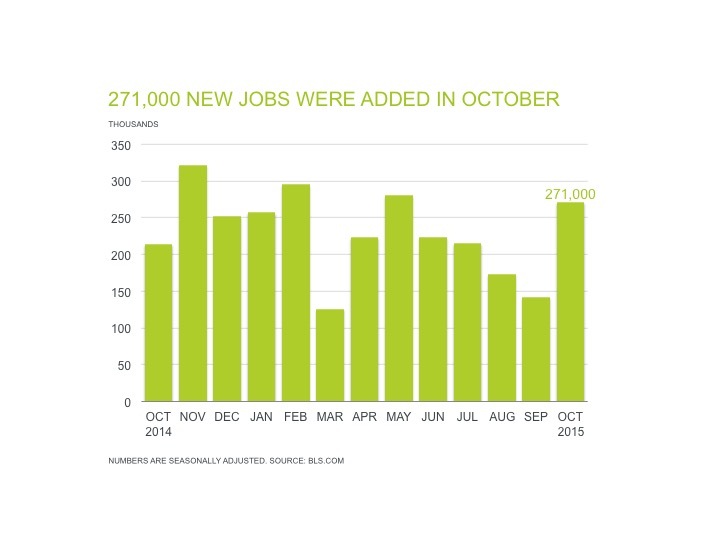 BLS revised August’s and September’s employment gains to add 12,000 jobs for each month. The unemployment rate remains unchanged at 5 percent, but the civilian labor force participation rate was also unchanged at 62.4 percent. Friday’s jobs report is renewing talks that the Federal Reserve will raise interest rates in the next few weeks for the first time in nearly a decade. Healthcare added 56,700 jobs in October. The health industry has created an average of over 40,000 jobs per month. Professional and business services added 78,000 jobs. Job gains has averaged nearly 50,000 per month thus far in 2015 compared with an average monthly gain of 59,000 in 2014. Retail trade employment increased by 43,800 jobs, with an average monthly gain of nearly 30,000 over the prior 12 months. Administrative and support services added 45,700 jobs. In the next few months, healthcare, professional and business services, and retail trade are expected to contribute large increases in job gains. While the above sectors saw robust employment gains, hourly workers are still subject to wage stagnation that are affecting the non-professional ranks. Salaries for non-clinical health workers are expected to grow 2 to 3 percent from 2015 to 2016. Employment in health services management is expected to grow 23 percent from 2012 to 2022, according to BLS’s Occupational Handbook—while the average growth rate for all occupations is 11 percent. And by 2022, there’ll be 22 million workers in the U.S. healthcare industry. Download our free 2016 Salary Guide so you can attract top talent.